The Touch and Learn Activity Desk Deluxe by VTech is a three-in-one desk with interactive activity cards that’s expandable for more fun and discovery! 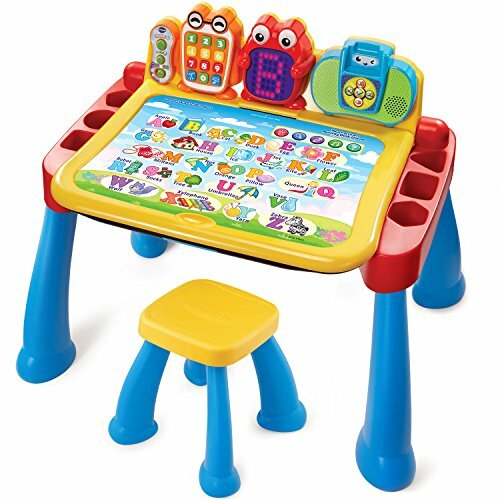 The desk features an interactive desktop and five pages to explore that are filled with engaging content including letters, numbers, music, colors and more. Choose from eight expansion packs (each sold separately) that each focus on a specific curriculum like nursery rhymes, reading skills, animals and numbers. It also transforms from a desk into an easel and chalkboard with plenty of storage space for art supplies to encourage play and discovery. The LED display illustrates letter and number stroke order and how to draw basic shapes. For even more fun, your toddler can play with the toy telephone or listen to fun tunes on the music player. Enjoy hours of fun as you create, discover and learn! Stool included. Requires 4 AA batteries (not included). Intended for ages 2 years and up.